नई दिल्ली - 110016/ New Delhi - 110016. Subject: - Grant of Dearness Relief to Central Government pensioners/ family pensioners- Revised rate effective from 01.01.2019 under Seventh CPC. It is to state that the Govt. of India, Department of Pension & Pensioner’s Welfare has issued an Office Memorandum No. F.No. 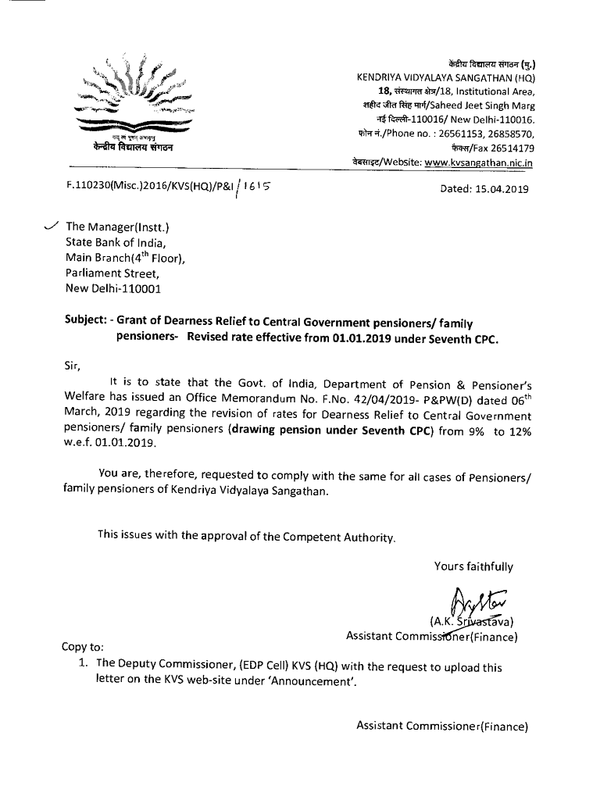 42/04/2019- P&PW(D) dated 06th March, 2019 regarding the revision of rates for Dearness Relief to Central Government pensioners/ family pensioners (drawing pension under Seventh CPC) from 9% to 12% w.e.f. 01.01.2019. You are, therefore, requested to comply with the same for all cases of Pensioners / family pensioners of Kendriya Vidyalaya Sangathan. 1. The Deputy Commissioner, (EDP Cell) KVS (HQ) with the request to upload this letter on the KVS web-site under ‘Announcement’.